Fifty-four readers love this post. Another year, another few hundred menus tasted and perused around the globe. Though my 2014 wasn’t quite the travel schedule 2013 was (25 cities and 10 countries!) with my job as Zagat SF/Bay Area Editor, it was still a nonstop year that took me from places like Tokyo to New Orleans, NYC to Hong Kong. Here are my 2014 best bars lists (more for best in food/dining here) covering the Best New Bars in San Francisco (opened December 2013 to November 2014), my 6 Best Bar Experiences USA and my 10 Best Bar Experiences Global, which are not necessarily new but those in which I tasted the best drinks and had the best service of the year. Click on each bar name for my original articles – some I will be reviewing in the coming weeks. The San Francisco portion of the list was first published here at Zagat on December 29, 2014. Thanks to bar manager John Codd and bar master Erik Adkins (Slanted Door, Hard Water), The Coachman is one of the great new bars in SF where each drink is expertly made, based off of obscure, historic recipes and the Scotch and rum selections are strong… as is the food from Charles Phan and team. Todd Smith (founding bartender of Bourbon & Branch, currently also The Hideout), Ryan Fitzgerald (formerly Beretta and brand ambassador for Del Maguey Mezcal) and Erik Reichborn-Kjennerud (Dalva/The Hideout owner) have opened what is easily the new drink (and food) industry hangout, welcoming everyone with a smile, quality cocktails across a range of spirits and creative bar food from one of our Zagat 30 Under 30 chefs this year, Kevin Cimino. Trou Normand feels like Paris meets NY in SoMa with house charcuterie that makes all others seem lackluster. The elegant, high ceiling bar — from Bar Agricole owner Thad Vogler and crew — is all about house selected barrels of Armagnac, Cognac and Calvados and refined cocktails made with these French spirits (and beyond). The pioneering Long Now Salon has one of the coolest bars in this (or any) city, complete with salon talks and a library to restart civilization with. Thanks to Bar Manager Jennifer Colliau (the mastermind behind some of the best cocktail modifiers out there, Small Hand Foods), multiple menus-within-a-menu are pioneering, including a Drinking Around the World menu highlighting drinking customs from many countries. Upscale Fifth Floor transformed to Dirty Habit as of May 1st, thankfully with the same team in effect: chef David Bazirgan, pastry chef Francis Ang, master sommelier Emily Wines, sommelier Jose Maria Aguirre and lead bartender Brian Means. The space was completely remodeled and the sleek outdoor patio with rectangular rock fireplace is one of the coolest downtown hangout/gathering spots. But most importantly, besides memorable food, Means’ cocktails — and an extensive selection of whiskies and rarities — still make it a strong bar. Danny Louie (formerly of the Alembic) has long been one of SF’s great bartenders and now he has a menu to showcase his talent and playful use of Asian spirits like baijiu, Asian teas, boba (think boba slushie cocktails) and all manner of spirits and ingredients in his creative, fun cocktail menu that is the draw at the new Chino. A new location and first time bar for longtime Mission creative-Mexican gem, Loló (also with a new sister Peruvian-Mexican restaurant, Loló Cevicheria), resulted in a solid initial cocktail menu. But at the end of summer, bartenders David Gallardo and Leon Vasquez stepped up the game with Trick Dog-esque artistry: a cocktail menu lineup of playing cards from Tablero Loteria, a Mexican card game reminiscent of bingo. Call it most improved within a couple months of opening. Alongside gratifying Mexican dishes from none other than Traci Des Jardins, Arguello opened in the historic (and just remodeled) Officers’ Club in the Presidio this October with an agave spirits list (tequila- and mezcal-heavy, as well as less common agave spirits sotol and bacanora) and excellent cocktails from Enrique Sanchez (formerly of Puerto 27, La Mar Cebicheria). His ever-balanced, delicious cocktails are even better invigorated by fresh air within the white walls of the restaurant’s outdoor patio surrounded by majestic cypress and eucalyptus trees. Opened in May in the Dogpatch, Smokestack is an ever-bustling source for BBQ and Magnolia beers (since the owner is Dave McLean of Magnolia). But bar manager Eric Quilty’s cocktails are a real draw, adding an elegant-yet-approachable touch to beer and ‘cue in the wood-lined, hip space. One of the new bars I most want to hang out at is Urchin Bistrot. The restaurant serves excellent modern French bistro fare at reasonable prices and the France-and-beyond wine list is sophisticated yet approachable. But cocktails from former Comal bartender Rafael Jimenez Rivera are also a draw, sometimes highlighting French aperitif liqueurs and Italian amaro. There often seems to be a seat at the bar and a warm welcome, making the space feel like the best neighborhood bars/restaurants of Europe. Longitude opened this summer in downtown Oakland, an oasis of tropical design with elegant Tiki and rum cocktails partnered with pupu platters. Behind covered windows wrapped in vintage maps lies an otherworldly space that feels like Africa-meets-Polynesia circa 1930s, with plenty of green, bamboo, palms, mounted wall masks and artwork — much of it collected personally by owner Suzanne Long — from Indonesia to Africa. A fantastic exotica soundtrack transports in Polynesian-Tiki style with refined, rum-centric cocktails. Though The Farmer & the Fox and Archetype are both Napa Valley newcomers doing quality cocktails, La Taberna, in downtown Napa, feels like what was missing from all of Wine Country. With a chalkboard of changing tapas in a sleek downtown Napa space, most tapas are merely $4-7 — and absolutely delicious. Craft beer, wine — both local and international — a sherry by-the-glass list seals the deal with a few transporting (takes me back to Spain) low proof cocktails utilizing sherry, port and the like. The quality is high and the price is right. Wine Bars: While there were a number of notable newcomers this year, like these three, this year, it was all about Les Clos. After my recent mind-blowing travels around Japan, I more than appreciate the concept and inspiration behind Bar Jackalope, opened in January, hidden in the back of Seven Grand. Though there are so many ways it doesn’t (and couldn’t) compare to Japan, including the rarity and affordability of the whisk(e)y selection, it is still a blessedly unpretentious, mellow, intimate spot despite the speakeasy nature — with a broad whisk(e)y selection and a cigar porch to boot. Bestia has been at the top of every kind of restaurant list since it opened in 2012 and is still one of the hardest reservations to secure in town. Despite almost deafening noise when the place is full, I found the bar (first come, first served, though I recommend getting there before they open) not overwhelmingly loud, with full food menu available and the bar staff knowledgeable, in line with the best restaurants here at home or around the world. The white wine and Riesling-heavy (yes!) wine list is impeccable (thanks to wine director Maxwell Leer) and the well-executed cocktails were created by LA bar great Julian Cox. Michael Lay’s (former bar manager at Restaurant 1833 in Monterey) refined cocktails are one of the key strengths of Faith & Flower, open in downtown LA this Spring. It’s one of the more striking dining rooms and bars in LA (a city with plenty of notable spaces): lush with greens, leather booths, velvet, crystal chandeliers, feather fans and, as at 1833, featuring absinthe and amaro carts, historic drinks with modern focus and a robust spirits collection. Square Root is easily the most exciting newcomer to New Orleans on the dining side — and the same holds true for its upstairs bar/lounge. The lovely space in a historic building boasts a balcony and a wrap-around bar from which bartenders turn out impeccable cocktails, dishes and bites akin to the creative quality I love at their parent restaurant, Root. Easily the most consistent quartet of restaurants in Seattle are those from Renee Erickson that have been consistently amazing, three of them taking up my top Seattle dining recommends. Alongside daily changing seafood small plates blissfully heavy on sardines, oysters and the like, sitting at one long counter in an intimate space hidden upstairs across the hall from the Walrus and the Carpenter, Barnacle is even more a pleasure because of its Italian amaro selection in simple but well-executed cocktails, like a bracingly bitter-refreshing Chinato cocktail, mixing the ultra-bitter Amaro Sibilla with Italian Chinotto soda. More on my top Seattle bar recommends here. Saxon + Parole has been one of my favorite NY bars for years since Naren Young used to oversee the program. It remains a favorite in its current days and the best visit of all the many bars I hit during yet another return to my teenage years home of the suburbs of NYC. Under the able hands of Masa Urushido, a gracious bar manager who came from some of Tokyo’s top bars in 2008, seasonal cocktails in particular are stunners, deftly utilizing produce, herbs and spices. Bar Benfiddich is utterly transporting, feeling like a colonial tavern from the 1700s hidden upstairs in an office building, all rustic wood and brick, dim with a Colonial-era painting illuminated behind the bar. Best of all, bar master Benfiddich is a wizard with cocktails and making his own spirits, steeping botanicals on the spot from an ancient book of distilling with recipes he’ll point out to you. Alongside an impressive absinthe collection, he also makes his own absinthe — and if you ask for his house root beer, be prepared to be wowed. Another “wow” experience is the intimate Gen Yamamoto, run by the masterful Gen Yamamoto himself. Gen keeps an austere yet approachable bar of a mere few, rare bottles in a minimalist room marked by a wide, hand-carved, knotty bar from which one watches Gen work. Cocktails can be ordered individually or as 4-6 course tasting menus, featuring rare spirits from gin to sake and the impressive array of Japanese produce in season at its peak, thoughtfully matched with each spirit. Think luscious, massive Hokkaido Niagara grapes with sparkling Nigiri Sake Dassai 50. One of the most uniquely brilliant bar experiences — and whisky collections — in the world, is Zoetrope. The emphasis is on Japanese whiskies, including all those impossible-to-find Chichibu card series bottlings from the ‘80s, shockingly available by the pour or half pour — and at reasonable prices (no more than $20 a pour). 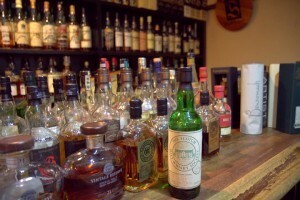 But you’ll also find a number of Scotches and American whiskies. The owner is a huge movie buff so films play on a back screen while his 3000+ film score soundtracks loop. It’s one of the most wonderfully unique bar experiences in the world. Japan offers one “best in the world” bar experience after another and Bar Calvador is truly one of the greats in the world. For Calvados (French apple brandy) lovers, it’s unreal. The biggest Calvados collection in the world, over 300 bottles and counting, is housed in a tiny, 2nd floor bar with no more than the symbol an apple as any indication it exists from the street. Bar manager Hiroyuki Takayama is a global Calvados ambassador and offers pours from 50, even 80 year old Calvados… or stunning rarities like an 1869 Calvados. It’s an incredible way to get “schooled” on the great brandy of Normandy. My first night in Tokyo was sheer magic, thanks to legendary Y & M Kisling (pictured top). Hidden on a 7th floor in Ginza, the dark wood-lined bar glows with a 1930s elegance, jazz softly playing in the background, bartenders in cream-colored jackets and the ever-impeccable collection of Japanese barware and glassware, perfectly stirred or shaken cocktails and the house drink, Kaikan Fizz (created by head bartender Mitsugi Yoshida, who has bartended for over 55 years). Served in a highball glass, it’s frothy and bright, mixing gin, whole milk, fresh-squeezed lemon juice, simple syrup, shaken and topped off with soda water. The experience is so transporting you feel as if you’re both in another world and another time. The Envoy may be the most exciting of Hong Kong’s newcomers, thanks to bar manager Amanda Wan and star Hong Kong barman Antonio Lai (also behind the bars Origin and Quinary). Soft opening this summer in the gorgeous Pottinger hotel up a cobblestone Central street, The Envoy is tucked upstairs on the third floor, a chic wonderland of elegant wallpaper, alcoves, a long bar — including a corner reservations-only bar within full view of a centrifuge and other house equipment — and a white light-strewn patio. The magic of the space translates to the playful drinks (think a blood bag beet and genever cocktail — delicious despite how it sounds) and tea cocktails embracing the all-important British-Chinese afternoon tea ritual, celebrated here with creative bites. In the US, there are those rare, incredible sake tastings, like an experience of pairings with sushi from sake sommelier Stuart Morris at Pabu in SF, where you can taste sakes ranging funky and mushroom-y, to pine-y and aromatic. And then there’s Yoram Sake, a once-in-a-lifetime sake bar run by Yoram Ofer, an Israeli sake master who also exports sake to the US and beyond. The quiet, intimate bar is merely a few seats (are you seeing a common theme here in Japan?) and the rarities run from elegant, young sakes to 20-30 year aged sakes that invoke stewed onions and beef jus. It’s an almost sacred experience immediately elevating love of sake to another level. Harder to find and without a website (yes, the spelling of the name is correct), this tiny bar is not much bigger than a closet but equipped with many rare Japanese whisky and Scotch bottles behind (and lined across) the bar. The kindly owner walks you through treasures like old bottles of now-defunct Karuizawa Japanese whisky and 1980’s Mars Single Malt from the Shinsyu Distillery. Amsterdam boasts a number of unforgettable dive bars: intimate, historic spots bursting with character, and in the case of Cafe de Dokter, dust. The dust has never been cleaned on bric-a-brac lining the walls of this dim haven enhanced by mellow jazz tunes and a laid back bartender. The bar was founded by a surgeon in 1798, has been run by the same family for generations, and is wonderfully creepy with old clocks, birdcages, ventriloquist doll, a hanging doctor’s bag. It’s about all the atmosphere, not the drinks (hence the “dive” label), so a good pour of whisky is the ideal way to go. You won’t find the like of it anywhere else in the world. In a town rife with cool outdoor patios, Duddell’s may be one of the coolest. The expansive, open air lounge upstairs from the two Michelin-starred restaurant opens out onto a large patio lined with tropical foliage, vintage lawn furniture and tables, surrounded by skyscrapers. The artful, British-influenced menu from salon manager Marek Vojcarcik highlights cocktail classics (like a twist on a Gibson with Tanqueray gin, dry vermouth and a garnish of baby pickles) and creative house drinks like Opium, a Scotch-based drink laced with peach, lime and poppy seed milk.